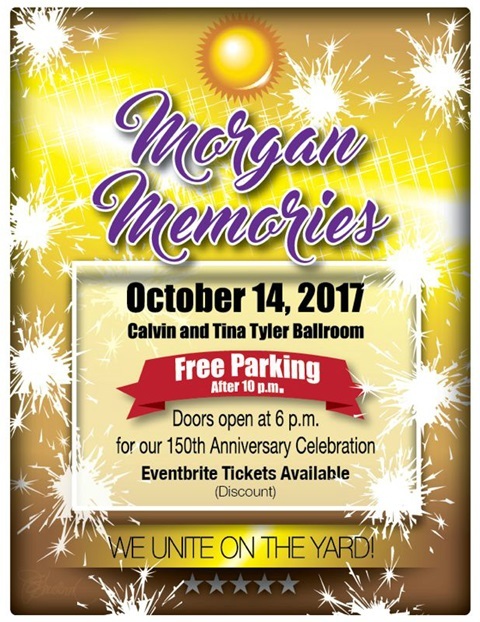 On October 14, 2017, we gather at our alma mater Morgan State University for our festive Homecoming Saturday on the yard. Oh, the yard what memories that will be revived that day on our yard. That first college love, that first actual sense of independence that college life may have afforded you. The daily meetings that couldn’t be missed as we practiced bridgeology. Some of our friends fell by the wayside because they mastered that specific class and not the others. Yet whether you mastered the bridge, and even mastered the classes Morgan Memories are for everyone. We all walked the yard with educational masters of our race. The wonderful professors who guided us to become all that we should and could be. The friends, oh, all the friends from fraternal brothers and sorority sisters, from the associations of the student government, and the many, many clubs that nurtured our development. Morgan Memories captivated us all. Morgan Memories remain for each of us for a lifetime. We developed lifelong friends who have been with us to cherish our up’s and comfort us during the downs. 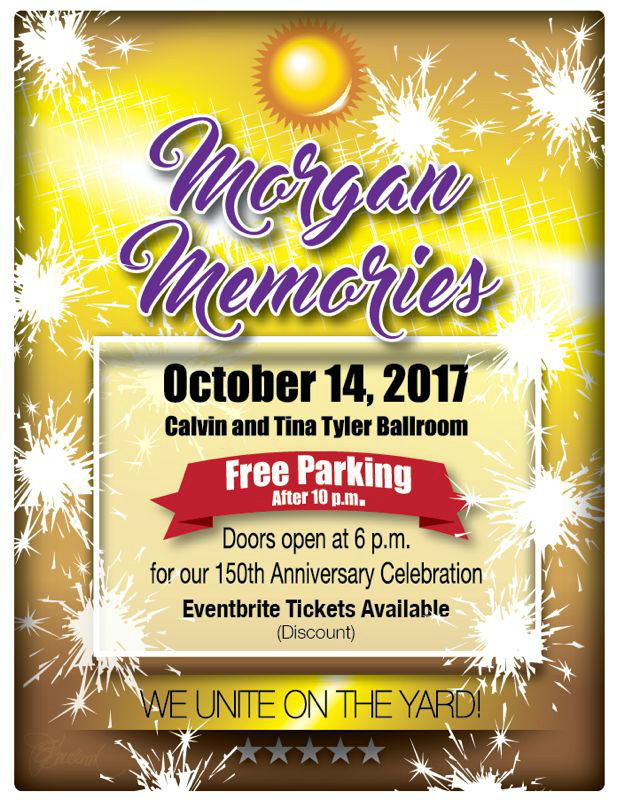 Yes, Morgan Memories is more than just not another event that occurs each Saturday after the homecoming football game. Morgan Memories is the essence and flow of blackness that embodies the spirit of each and everyone who has experienced our Fair Morgan. You see in 1867, exactly 150 years ago when Morgan was founded was the actual beginning date for the initial Morgan Memories. 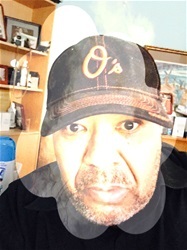 Each one of us carries with us a little of the soul of each and every person who has called Morgan State University home during those years. Morgan Memories is more than just a party, you see party’s come and go. Anyone can have a celebratory party, get a DJ, some party favors and find a location and open the bar. Yet, Morgan Memories is beyond the party. It is the culminating event of a Saturday where you reigniting relationships with people whose path you may have crossed 10, 20, 30, 40 or even 50 years ago. It’s igniting new friendships with classmates who are 10, 20, 30 or even 40 younger than yourself. That’s right classmates all because once you walk on the hallow grounds of Morgan State University. You instantaneously become classmates with each and every person no matter his/her race or creed who taken that walk with or before you. I remember that distinct January day that Dr. Clayton Stansbury telling the all of us freshman in Murphy Auditorium in 1973 to look to your right and you're left most likely one or both of these individuals won’t complete this initial journey to graduation. I was a second-semester entering student so orientation wasn’t as comprehensive. Yet I remember those words because in reality what was said was true. I think that Doc could have added look to your right and left because each of you are now part and parcel to the wonderful world that will be your Morgan Memories. That is why it is so important to have a celebration of this type on campus. The campus that brought the magic, mystic, and wonder of what is everyone’s personal Morgan Memory treasure chest. You see on Friday the Morgan Gala takes place off campus where the connection begins as a massive fundraising event to boost the Morgan Foundation. So it is imperative that Morgan Memories takes place on the campus and not some facility miles away from our YARD. You see our YARD is where the energy of remembrance flows. That electricity of memories that ignite old relationships and create new ones. Anyone can have a party but only few can create an experience. That is exactly what Morgan Memories is an EXPERIENCE, and if you haven’t ever been to one. You surely are missing out to reigniting the flame of memories that are uniquely yours and yours alone. See you at Morgan Memories, 2017. From sundown to the wee hours of the morning we all will be celebrating in our own special way Morgan Memories.